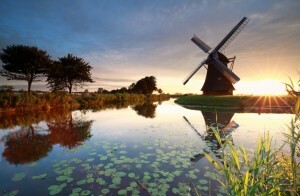 The Dutch built windmills across their countryside recording back to the 8th century as a means to keep water flowing from the lakes to prevent flooding. Present day travel through Holland includes spotting these monstrous irrigation systems throughout the countryside. They loom over the vast fields and lakes, standing out in the miles and miles of flat, sparsely populated land. What is it about these generators that make the Dutch countryside so charming, and why do you need to see them first hand? Prior to 1400 AD, the living conditions in the Netherlands were moist, to say the least. Because of the country’s proximity to the sea, and the average rainfall a year, the Netherlands consisted mostly of swamps and wetlands. A risk of flood and poor crops forced the Dutch into thinking of innovative ways to keep their land dry. Sea defenses were implemented and dams were built but the windmill was a necessary creation in order to drain the many lakes and marshes that affected the land. Over time, the Dutch were able to use the windmill for other purposes, such as the production of oil, paper, and even mustard. There are 991 windmills left in the Netherlands, according to Groningen University. Windmill production decreased with the discovery of steam power at the start of the industrial revolution. Present day manufacturers have implemented the use of the windmill globally as means to decrease usage of natural gas. By 2013, over 2,000 wind turbines were built for use in the Netherlands. While windmills are used to pump water, wind turbines are used to produce electricity. The Dutch are trying attempting to meet the EU-set target of producing 14% of total electricity from renewable sources. Although the wind turbine and the windmill serve separate purposes, both use the wind that passes through the Netherlands to generate power. The Netherland’s town, Kinderdijk, is one of the most famous places in the world to see the towering wind-generated apparatuses. When you visit, you can see 19 windmills dating back from the 18th century. The town is surrounded by rivers and canals, making the windmills a necessary addition to the land. Visitors can take a bottle of wine, a basket of cheeses and fruits, and enjoy the historical view in the breezy weather of Holland. If you have any questions or want help booking your European adventure, please contactAESU by calling 800-638-7640, or fill out the contact form found on our website! This entry was posted on Wednesday, August 24th, 2016	at 3:42 pm	. You can follow any responses to this entry through the RSS 2.0	feed. Both comments and pings are currently closed.